Eportfolios offer a ‘learner-owned, learning-centred’ approach through improved ongoing support and feedback, and ownership of learning by individuals. This approach works particularly well for distance and workplace learners, and helps people develop valuable lifelong learning and digital age skills. 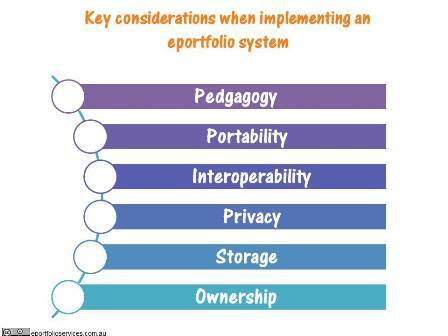 However, there are many considerations when implementing eportfolios. The following are the top six things you should be considering when getting started with eportfolios or before selecting an eportfolio system. A ‘learning-centred’ approach to education and professional development can be very challenging for educators, managers and mentors, which can be very disruptive for the implementing organisation. Implementing an eportfolio approach to learning when disruption to an group/organisation will already be happening offers a good opportunity to ‘re-think’ current practices and is the best time to consider implementing eportfolios eg when introducing a new a program, curriculum or subject or reviewing an existing one. This move is challenging for most key stakeholders, and can challenge current beliefs and assumptions about education, training and/or professional development. This requires that supportive processes are put into place to transition across to this new approach to learning and teaching. As eportfolios are “learner owned”, individual user’s eportfolio content needs to be easily exportable to another eportfolio system or format which will allow them to continue to access/use their eportfolio when they are no longer a member of the eportfolio-issuing organsation. Eportfolio systems which support the exporting of user content to HTML, PDF and/or LEAP2A should be investigated first. Alternatively, users may be given ongoing access to their eportfolio beyond their time with the issuing organisation, such as through an alumni or similar. Or, the eportfolio service may allow the user to take-over the cost of their eportfolio (eg usually a nominal annual fee) to enable ongoing use. To be really effective, the eportfolio system should easily integrate with other systems which support the user’s learning such as learning management systems (LMS), learner results databases and/or HR databases. This will enable the ease of exchange of data between systems, and/or allow the user to only have to sign into one system and then be able to move between the other systems through a ‘single sign-on‘ approach. Users will also want to be able to easily access and update their eportfolio using mobile devices such as smart phones and tablets. As users will be storing their personal and private information in the eportfolio system, it is important that the eportfolio system allows the user to only release information, and/or provide accessible to their eportfolio, to those people who have been given permission to access it. Users will also need to be supported in how best to manage their privacy with using an eportfolio. 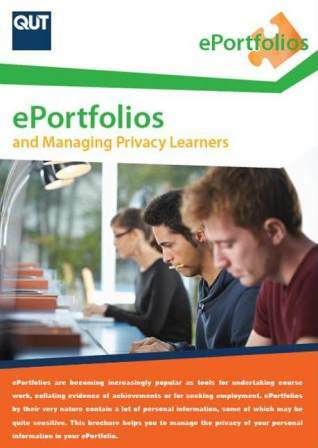 Support materials for educators and organisations to help users effectively manage their privacy using eportfolios are also available. To ensure that users make the most of their eportfolio it is important that they are given adequate storage space to cater for the different file types needed to support their learning. This may be within the eportfolio system’s storage capacity, or by making use of other storage space such as embedding files from Google Docs, images from Picasa or video from YouTube, or similar. This may mean giving every user the same amount of storage space or having different quotas for different users, depending on their individual or group needs. Either way, there should be a means by which users’ storage quota can be easily adjusted, either on a per user basis, group or whole of organisation basis. Producing information in an eportfolio (or online in general) means that users can easily share their information with others, so it is important that users understand how to protect the ownership of their own information online. Creative Commons Licenses are one way to allow individuals to self-assert exactly what people can do with their work and can be incorporated into eportfolio pages. Users will also need to be supported to understand how to appropriately use other people’s information online, especially if they are going to publicly publish components of their eportfolio. Implementing an eportfolio means investing a lot of time, money and resources. Taking some time in the initial stages of the implementation process to take into consideration these points will help you ensure that your investment pays off through better engagement and use of eportfolios by all key stakeholders.